Pepper (Capsicum) belongs to the Solanaceae family and it is native to America. There are five domesticated species: C. annuum, C. chinense, C. frutescens, C. baccatum and C. pubescens. Peppers can be classified as sweet or spicy. 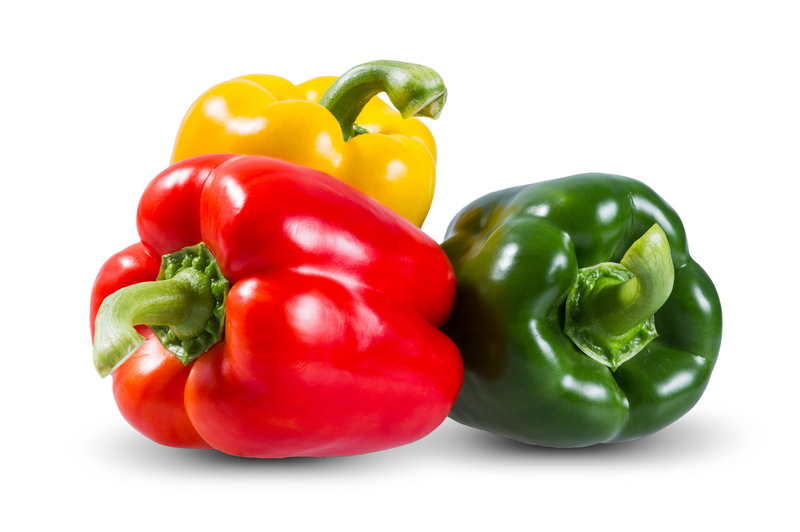 Sweet peppers vary in shape and size and also present different colour when reaching maturity. It is an herbaceous perennial plant with an annual cycle and its height can vary between 0.5 meter (in certain varieties of outdoor cultivation) and more than 2 meters (most of the hybrids grown in greenhouses). 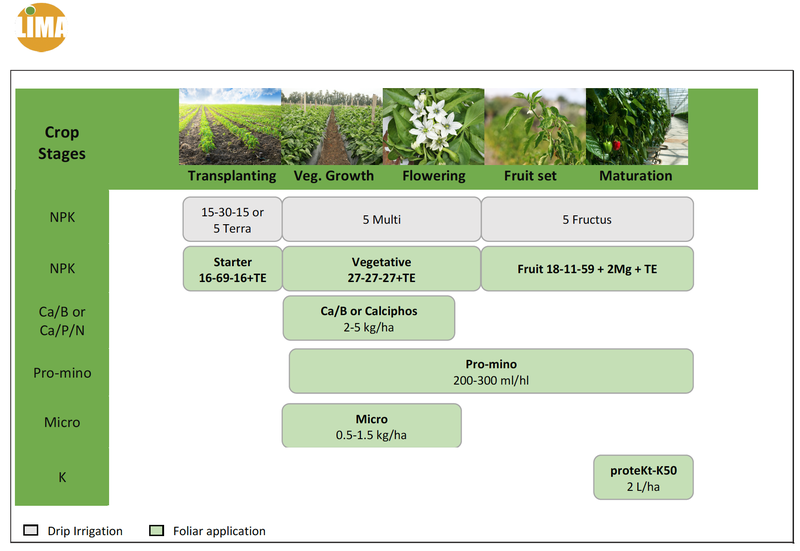 Growth stages of pepper plants consist of four periods: Young plant planting, Vegetative growth, from flowering to fruit set, fruit ripening to first harvest and from first to last harvest. Pepper is used as a fresh vegetable, pickled vegetable, fresh chili spice and dried paprika powder. Climate: Pepper is a demanding plant. Temperatures depend on the development crop stages. The average monthly temperature in order to get good harvest has to be from 18º to 22º C, being the ideal temperature from 20 to 25ºC during the day and from 16 to 18ºC at night. With lower temperatures the vegetative growth stops. Light: Very demanding, especially at early stages of development and during flowering. Soil: sandy-loam or loam soils, well drained and rich in organic matter (3-4%). pH: Between 6.5 and 7. Good development at pH 8 in sandy soils. Pepper is a very demanding plant in nitrogen during the first stages of the crop, decreasing the demand of this element after the harvest of the first green fruits, having to control very well its dosage from this moment, since an excess would delay the maturation of the fruits. The maximum demand of phosphorus occurs with the appearance of the first flowers and with the maturation of seeds period. The absorption of potassium is a deciding factor for the precocity, colour and quality of fruits, increasing progressively until flowering. Pepper is also very demanding in terms of magnesium uptake, increasing its absorption during maturation. Of the total quantities removed, fruits absorb most of nitrogen (64%) and phosphorus (77%), with the leaves accumulating the highest amount of calcium (79%) and magnesium (52%). Potassium is accumulated practically in equal parts by fruits and rest of vegetative organs. Foliar fertilization is the fastest and most effective method to supplement and enrich plant nutrition and to correct nutritional deficiencies when needed. This contributes significantly to higher and better quality productions. Lima Europe has a wide range of foliar fertilizers and special products for foliar application. To verify the safe rate under local conditions, it is advisable to spray recommended rate on a few plants. After 3-4 days check the tested plants for scorching symptoms. Fruit 18-11-59 + 2 MgO + TE: 2-5 kg/ha.